WINTER IS COMING- ARE YOU PREPARED? - Skytech Inc.
WINTER IS COMING- ARE YOU PREPARED? 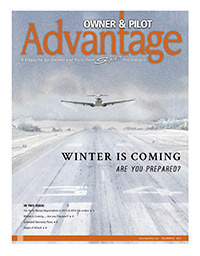 With talks of winter weather on the way, it’s not too late to ensure your aircraft is equipped to handle it. Take a look at the excerpt below, taken from the Fall/Winter 2013 Skytech Owner Pilot Advantage magazine. It’s that time of the year again. Time to turn on the heat, tune up the snow blower and break out the thick coats. Yes – winter is coming and with it we must be prepared to deal with unique, challenging and often times ever-changing conditions that test both pilots, dispatch and ground support staff alike. As with most things aviation, the devil is in the details and a little planning can go a long way to a successful outcome. Take the time now to brush up on your winter aviation acumen and enjoy the season for all it has to offer. “N1234 be advised there are reports of light icing at your altitude approaching the outer marker. A 737 shot the approach ahead of you and reported continuous light to moderate chop on the descent. Winds at the surface are variable between 350 and 270 at 18 knots gusting 35 and braking condition is deteriorating. Fly heading 340 and descend to 2000 feet, you are cleared for the approach….” Oh boy! Now not all winter weather is spent dealing with conditions like this. Winter can bring clear skies for miles, and cooler temperatures can boost both airplane and engine performance. But when it’s bad in winter it can be really bad. Among other things, winter weather means dealing with strong gusty winds, low-level turbulence and freezing precipitation both in the air and on the ground. As is necessary for all flights, it’s not only prudent, but required to ensure that both the airplane and pilot are capable of handling the anticipated conditions. As we move into the change of season ask yourself some of these questions to gauge you or your crew’s readiness. • Shorter days lead to an increased chance of night flight. Are you current on your night procedures, and how comfortable are you at night in certain conditions? • Strong and gusty winds are coming. Make sure you are ready with proper crosswind technique, and review both you and your airplane’s limits. Excerpted from the Skytech Advantage magazine, Fall/Winter 2013 Issue, Page 4. This entry was posted on Wednesday, January 20th, 2016 at 11:54 am. Both comments and pings are currently closed.